Kick Axe is a heavy metal band originating from Regina, Saskatchewan, Canada. The band consists of Victor Langen - bass, Larry Gillstrom - guitar, Brian Gillstrom - drums, Raymond Arthur Harvey - guitar, and George Criston - vocals. They are currently on a North American tour supporting the release of their Vices album, available on Pasha records. Columbus Review - When did Kick Axe first form? Victor Langen - We originally formed back in 1976. At that time the band was a three-piece made up of Larry, myself and my brother on drums. The lineup eventually evolved into Kick Axe as you see them today. The song "Heavy Metal Shuffle" was one of the first songs we ever wrote and has "stood the test of time", being included on our Vices album. In other words, parts of the new album go back to our very beginnings. Columbus Review - What is the current state of heavy metal in Canada? In England its popularity is declining, while in the United States it appears to be more popular then ever. Raymond Arthur Harvey - Canada seems to be about a year behind the states when it comes to music trends. Victor Langen - A lot of Canadian Heavy Metal bands have become more melodic in order to get airplay. We all sing in Kick Axe, and the melodies are very important in our songs. Raymond Arthur Harvey - We start writing our songs with a melody line, and then we add chords underneath it. Victor Langen - We originally did some Queen and Led Zeppelin cover tunes and we were influenced by their complex vocal structures. 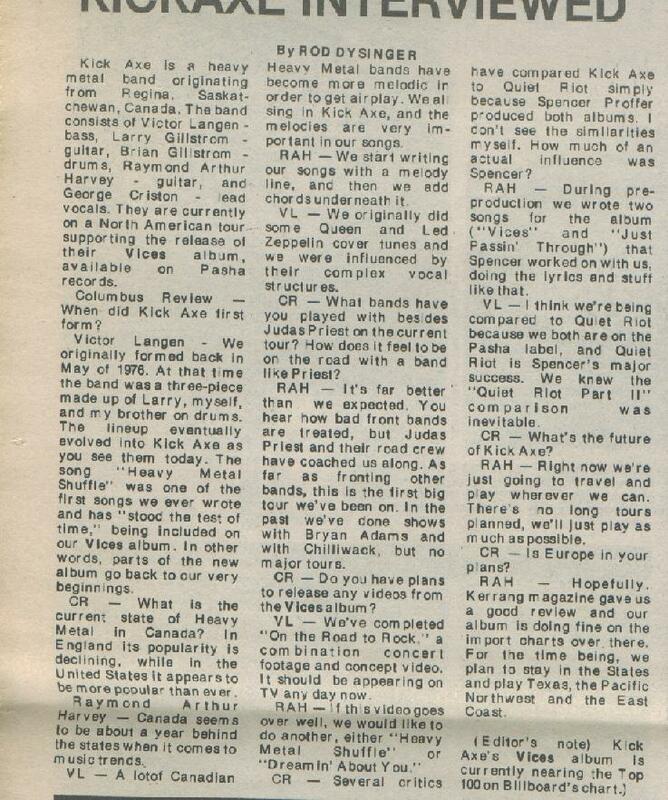 Columbus Review - What bands have you played with besides Judas Priest on the current tour? How does it feel to be on the road with a band like Priest? Raymond Arthur Harvey - It's far better than we expected. You hear how bad front bands are treated, but Judas Priest and their road crew have coached us along. As far as fronting other bands, this is the first big tour we've been on. In the past we've done shows with Bryan Adams and with Chilliwack, but no majors tours. Columbus Review - Do you have plans to release any videos from the Vices album? Victor Langen - We've completed "On The Road To Rock", a combination concert footage and concept video. It should be appearing on TV any day now. Raymond Arthur Harvey - If this video goes over well, we would like to do another, either "Heavy Metal Shuffle" or "Dreamin' About You". Columbus Review - Several critics have compared Kick Axe to Quiet Riot simply because Spencer Proffer produced both albums. I don't see similarities myself. How much of an actual influence was Spencer? Raymond Arthur Harvey - During preproduction we wrote two songs ("Vices" and "Just Passin' Through") that Spencer worked on with us, doing the lyrics and the stuff like that. Victor Langen - I think we're being compared to Quiet Riot because we both are on the Pasha label, and Quiet Riot is Spencer's major success. We knew the "Quiet Riot Part II" comparison was inevitable. Columbus Review - What's the future of Kick Axe? Raymond Arthur Harvey - Right now we're just going to travel and play wherever we can. There's no long tours planned, we'll just play as much as possible. Columbus Review - Is Europe in your plans? Raymond Arthur Harvey - Hopefully. Kerrang magazine gave us a good review and our album is doing fine on the import charts over there. For the time being, we plan to stay in the States and play in Texas, the Pacific Northwest and the East Coast. (Editor's note) Kick Axe's Vices album is currently nearing the Top 100 on Billboard's chart.